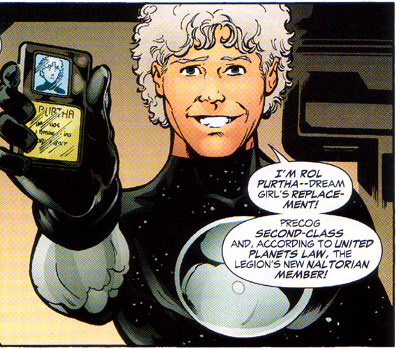 Dream Boy, aka Rol Purtha of Naltor, created by Mark Waid and Barry Kitson. Dream Boy was one of the few Legionnaires introduced in the threeboot era. He was a Naltorean precognitive who joined the Legion as a sort of replacement for Dream Girl, who had been killed shortly previous. The Legion didn't entirely trust him not to be a spy, and, in fact, he may have been, although he actually did keep faith with the Legion during his entire tenure with the team. Like Dream Girl, he could see the future, although he wasn't as good at it as she was, and he also didn't seem to have her combat training. I don't tend to identify with characters much, but something about Dream Boy did connect with me. I think it was how he was part of the team... but he wasn't really part of the team, and they moved on without him pretty much as soon as they could. (After Mark Waid left the title, subsequent threeboot writers Bedard, Shooter, and Thyme didn't feel the need to keep the character around, and discarded him with no ceremony at all.) But he was an interesting guy who had some appeal during his short time on the page (although not to the point of preferring him over any version of Dream Girl), and I'd like to read more comics about him someday. In his honor,the Threeboot Legion should be renamed the Dream Boy Legion.Any plans the writers had for the guy never had the chance to see print.That's the Threeboot in a nutshell. Oh, I think Waid did what he wanted to with him.